In a small bowl, combine 2 tablespoons of the mint with the garlic, ginger, paprika, cumin, coriander, cinnamon, cayenne and 1 tablespoon of kosher salt. Stir in 1/4 cup of the olive oil and rub the mixture all over the chicken. Cover with plastic wrap and let stand at room temperature for 1 hour. Preheat the oven to 400°. In a large ovenproof skillet, heat the remaining 2 tablespoons of olive oil until shimmering. Add the chicken, skin side down and cook over moderately high heat until browned, about 5 minutes. Flip the chicken. Transfer the skillet to the oven and roast the chicken for about 30 minutes, until cooked through. Transfer the chicken to a platter, cover and keep warm. Pour the pan juices into a heatproof cup and spoon off as much fat as possible. Set the skillet over high heat and add the stock. Cook, scraping up any bits stuck to the pan, until reduced by half, about 5 minutes. Add the pan drippings and season with salt and pepper; keep warm. In a medium saucepan, bring 1 cup of water to a boil with a pinch of salt. Add the couscous and dates, cover and let stand off the heat until the couscous is tender and the water is absorbed, about 5 minutes. Stir in the almonds and the remaining 1/4 cup of mint. 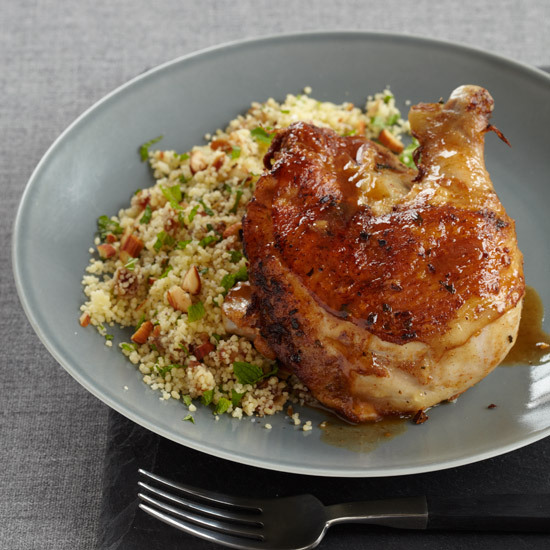 Mound the couscous on plates and top with the chicken. Spoon the pan sauce all around and serve right away. The chicken can marinate overnight in the refrigerator.